Formula 1 fans have been snapping up tickets for Russia’s first ever Grand Prix, to be held at the new circuit in Sochi in October. Event organizers hope to cover their operating costs through tickets, sponsorship deals and client services after the track has hosted two races. 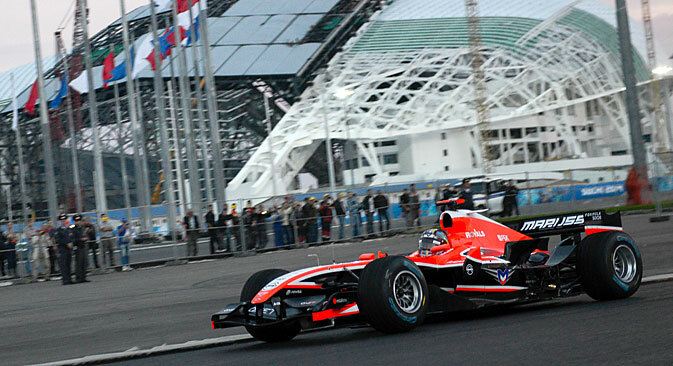 Tickets for the inaugural Russian Grand Prix, to be held on October 12 in Sochi, went on sale on Friday, May 30. As of 3 p.m. Moscow time on Sunday, about 20 percent of tickets for the Russian leg of Formula 1 had already been sold, Sergei Vorobyev, deputy director of event organizer Omega, told Vedomosti. The tickets, he said, have gone to private individuals, with "a considerable number" of applications for group trips also being processed. According to Vorobyev, demand in the corporate segment is also high, with "thousands" of tickets sold to meet orders from companies. Demand for all-inclusive trips is also high, he added. The Sochi track is ready to receive 46,000 spectators. In Vorobyev's estimate, the Sochi Olympic Park, where the main race and the other Grand Prix events (support races, concerts, etc.) is to be held, will be visited by a total of some 100,000 people during the race weekend. The organizers expect that no less than 20 percent of them will come from abroad. "After peak demand on Friday [when tickets went on sale], we have seen a constantly rising number of tickets being sold and we are absolutely convinced that all the tickets will be sold out well ahead of the event," Vorobyev said. Earlier, the promoter announced that by April 20, it had received more than 30,000 pre-orders, most of which were for two to three tickets each. "Our main business objective for the Grand Prix is to make sure that the operation is not loss-making," Vorobyev said, adding that the Russian promoter is seeking "to fully cover the operational costs" after two Grand Prix races through the sale of tickets, sponsorships and client services. The payback period for the track and license payments is considerably longer: The recovery of these costs can be discussed once two Grand Prix races have been held at the circuit and the track has been in operation for a year, Vorobyev said. The construction of the Formula 1 track will cost 11 billion rubles ($314 million), according to Gennady Sayenko, head of the track construction directorate at Omega. Tickets for the Sochi race are available on the promoter's official website: sochiautodrom.ru. There are 7,000 tickets for the General Admission Area at 5,000 rubles ($143); over 8,000 tickets for the Main Grandstand at 23,000 to 28,000 rubles ($657-800); 23,000 tickets for the Temporary Grandstands at 11,000 to 17,000 rubles ($314-485); over 3,000 tickets for the VIP Hospitality area starting at 108,000 rubles ($3,085); and 5,000 tickets for the Paddock Club at about 212,000 rubles ($6,057).